I attended both the UP-FLIPP LibSpeak 2009 and the UP-LISSA LIS Congress 2009 held last February 23 & 28, 2009 respectively. Both were spearheaded by students (mostly undergrad) of UP-SLIS. It is nice to be back at our Alma Mater and touch base with our future colleagues in the profession. Only Ms Zarah Gagatica was present in both of the student-led activities held six (6) days apart as one of the resource speakers. I enjoyed listening to her most in her LIS Congress appearance as she was on top of her element. Too bad her “performance” was limited to an hour by the organizer. Firsthand, I offer my profound congratulations to the students who conceptualized, organized and implemented this noble undertakings promoting awareness to LIS. As in any activity, we always have a post-activity evaluation. Let me offer then in the spirit of camaraderie, collegiality and as un-interested individual in SLIS student politics/rivalry (if there is any) about that recently held activity. 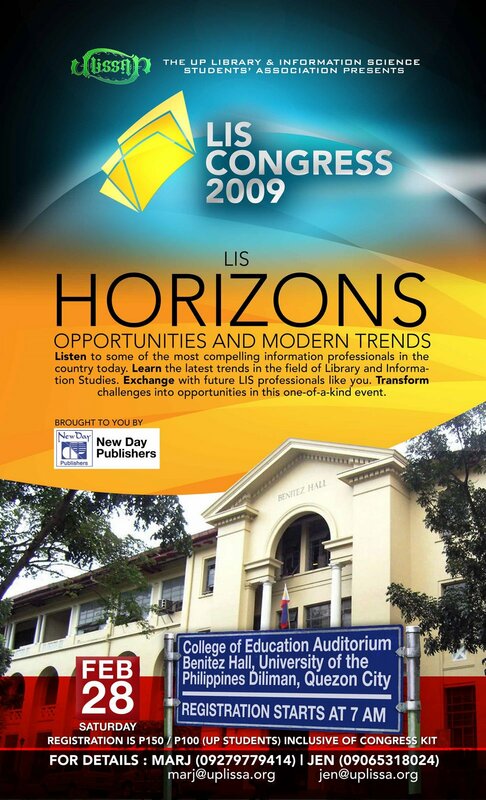 LibSpeak 2009 as per their handouts is in its 3rd year but their programming schedules need an improvement. It is impolite to subject your resource speaker to a diminishing audience simply because her allotted time is unwittingly close to lunchtime and participants are slowly leaving for lunch. It could be remedied in future activities by ending the morning program to 12 noon especially if no snacks will be serve in the morning. LIS Congress 2009 is the debut of UPLISSA in this type of activity and it is understandable that some birth pains was experienced by the organizing committee. Maybe next year congress, the topics will be more cohesive and not a “fruit salad type” of presentation. It is okay if it was a 2 or 3 days congress but compressing such heavy topics just in one day calls for indigestion and unnecessarily pressured the speakers from not further expounding their assigned topic due to time constraint. On the positive side, both used a marketing e-poster of good quality to announce their activity and if I may say so never resorted to by any professional librarians association in the country to date. Likewise their souvenir program, ID’s, and method of registration (especially that of UP FLIPP) was well done considering it is only a one-day-affair. Maybe on this two aspect alone we could learn a thing or two of hosting a conference/congress from our future colleagues. Kudos. (RBManlangit).